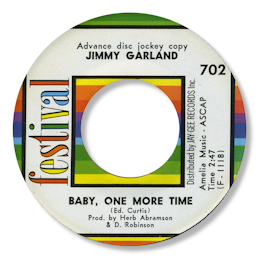 The New York based Festival label is a goldmine of deep soul – check out Louis Younger and Charles Lattimore for example – but perhaps the finest 45 on the label is this wonderful double sider from Jimmy Garland. The top side Baby One More Time is a first class blues ballad, full of super touches like the guitarists fills, the “climbing” horn chart and the stop go breaks. But the best bits are Jimmy’s falsetto bursts – simply thrilling. Flip the disc over for You Made A Promise and you get another scintillating vocal performance in a more orthodox soul ballad setting. Kudos to producer/label owner Herb Abrahamson for coming up with such a treasure.